We’ve all heard the phrase, “Beware the Ides of March!”, from Shakespeare’s Julius Caesar. It is a day that is used to denote infamy in our present usage, but for the Romans it was a deadline for the settling of debts. And it falls on March 15th every year. That day will now be remembered in New Zealand for the worst of reasons, and for years to come. Police in Christchurch received reports of a shooter at the Al Noor mosque at 1:40 PM NZST on the 15th in the first of two events that would leave 49 people dead and dozens injured. In all, there were two mosques involved with the same shooter. He started at Al Noor and then crossed the city to the Linwood Islamic Centre, where he was interrupted, fled and later arrested. In all the articles that list a time, it is listed as 1:40 PM. But that was when the police were called. The actual shooting would have taken place at least a minute of two before, which is why we have a chart with 1:38 PM as the time. That time gives quite an revealing Sabian symbol for the degree, 5° Gemini: “A revolutionary magazine asking for action.” The reason why it is so astonishing arises from the actions of the shooter prior to the event. From Dane Rudhyar, who wrote extensively on those symbols, he give an additional keynote: “The explosive tendency of repressed feelings and root emotions.” So, a little background on the shooter is in order. The shooter’s aims were simple and clear, even though he took 73 pages to explain himself in what he called his ‘Manifesto’. That was posted on the 8chan imageboard, along with a link to the live feed of the shooting. 8chan is also where QAnon posts, if one knows anything about that. As a site, it is raw, uncensored, and anything goes. I skimmed his manifesto, the main points for which are posted in the Wikipedia article about the shooting. He wanted to provoke anarchy and revolution, in order to restore (as he saw it) white European culture throughout the Western world. He also wanted to provoke discord in the US regarding its gun laws and the 2nd Amendment. He claimed that there was too much talk, too little action, and that he was taking a stand for ‘his people’. His efforts will have the opposite effect. The shooter saw himself as a highly motivated warrior type, acting as an example and catalyst to eventually restore western culture in the places where it was established, and to ‘drive the invaders out’, meaning non-Western immigrants. In Western cultures outside Europe, his arguments were way off mark in that regard, as it was Europeans who destroyed the native cultures where they colonized, but that is another story. But more than that, he was completely off the mark for the reason the immigrants are often in those places in the first place — because they were fleeing Western-backed wars in their home countries. Those wars have killed around 8 million people since 2001, in distinction to only several thousand killed in terrorist attacks in the West. In short, he saw himself as having a duty and righteous indignation at what he saw evolving in the West, committing his acts to do his part to correct what he saw as social inaction, the weakness and/or complacency of ‘his people’ (i.e. white Europeans) and as opposing the corporate state and NGOs that were steadily eroding society. Is he shown in the chart? Indeed, he is. Moving to the chart, then, the 7th house represents the assailant, or open enemy. The purpose of the chart is indicated by the Ascendant. The Midheaven shows the public face of the event, in this case Pisces, and Pisces represents places of worship, among other things. The degree for the Ascendant reflects the shooter’s ‘Manifesto’. The 7th house is ruled by Sagittarius, which in turn is ruled by Jupiter, one of the lower aspects of which is hubris and self-righteousness. Jupiter is in the house it rules, giving it more than the usual power, and it is square the Sun, placed within minutes of the Midheaven, regardless of the chart one uses (within a few minutes of time). The Sun/Jupiter square is also one that can yield a bloated sense of self-importance. The Sun rules the 3rd house (media and communications) and he made certain to broadcast his acts as far and wide as possible. He live-streamed the attacks to Facebook, since taken down, and his supporters on 8chan cheered him on while the attack was taking place, over the space of 17 minutes. And we are not even considering the chart of New Zealand here. And there are supporting factors to suggest a very violent act and mass death. The Sun/Jupiter square shows the excessive nature of the event. Sun=Mars/Uranus points to: “A sound physique capable of sudden extra-effort, a person who is able to act quickly. 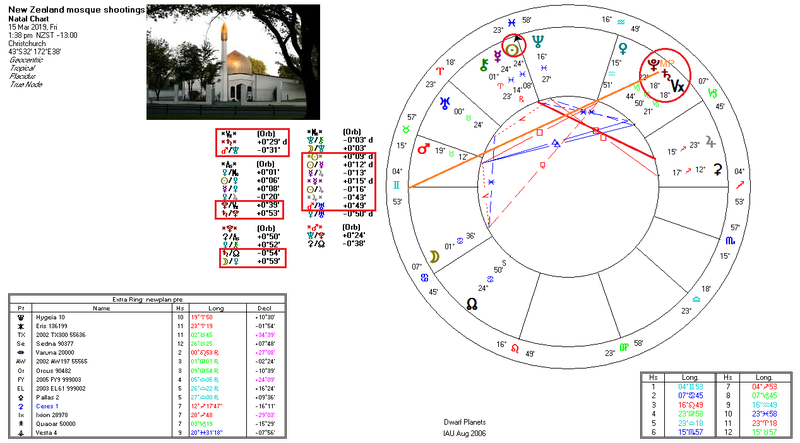 – A sudden adjustment to new circumstances and conditions in life, injury, accident…” (the shooter had worked as a personal trainer), and with the Sun conjunct the MC, we have MC=Mars/Uranus: “a person “putting the pistol to someone’s head”, an act of violence, extraordinary achievements. – The execution of drastic and violent measures, injury, accident, operation.” The preceding words in quotes are from Ebertin’s Combination of Stellar Influences. We could say quite a bit more, but what would be the point? The chart is clear enough, once one digs into it a bit. But there are more important things to consider, like the victims and how society responds to the tragedy. The Midheaven (MC) is Pisces, which marks ending, death, institutions and spiritual expansion. The latter indicates the higher possibilities, in that it should promote a greater coming-together of the community. With the Vertex in the 8th house the event should act to transform the lives of those involved and society. The Moon is in Cancer, marking the masses and societal concerns in general. There were also many women and children among those killed, which the Moon also rules. No mercy was shown to anyone, again reflecting back to the Saturn/Pluto in the 8th house in Capricorn. 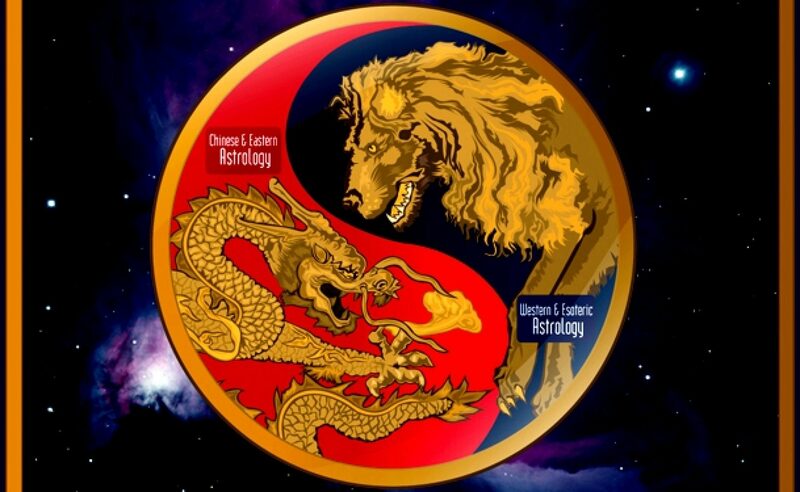 Of interest is that the Moon is in the 21st Chinese lunar mansion, which can also indicate violent and sudden ends. The shooting has sparked debate on social media, as these things usually do. Incidents such as this bring out all the claims of “They’re coming for your guns!”, “It was a false flag”, “It was a covert op” and so forth. Worse yet, the claims and counterclaims only reinforce social divides and between the so-called ‘right and left’ in politics (an unfortunate mis-appellation) and the various camps who have their differences with society as it is. None of that sort of echo chamber discourse is helpful, nor does it work toward solving anything, or toward advancing society. For her part, Jacinda Ardern, NZ PM, says the gun laws will be changing, on a note similar to what happened in Australia after the Port Arthur massacre. People the world over condemn such violent acts, which is right and good, because all such acts do is to radicalize others and destabilize society. That is the whole point of such planned episodes. They are also used to further political ends and specific agendas. We won’t go into all that here. The shooter spoke of falling birth rates for whites and higher birth rates for immigrants, displacing the European-type cultures, as one of his motivations. Yes, that is a concern for many people, but it will not be solved by methods such as his or by violent revolution or ethnic cleansing. We are supposed to be beyond all that in our civilized societies. The reasons for falling birth rates are many and varied, but on the whole they are related to our modern society, the necessity for women to have to enter the work force, which delays their having children and the number thereof. It is both a societal and an economic problem. And it will not be solved by border controls, or by deporting migrants. There no single or easy solution. Increasing migration quotas will not solve social ills, either. Immigration is another vexed issue, which is used to political purpose and in many cases purposely disadvantages immigrants, only to perpetuate the problems. So, I mentioned earlier that there should be a spiritual dimension to this event, as indicated by the chart. The major issues to be addressed have nothing to do with guns laws and immigration, although sensible laws on both are needed. More to the point, there is a lack of proper discourse, community-wide, about the issues that we face, with one of the prime areas being economic. Of all the Western nations, New Zealand has probably deserved this type of event the least. 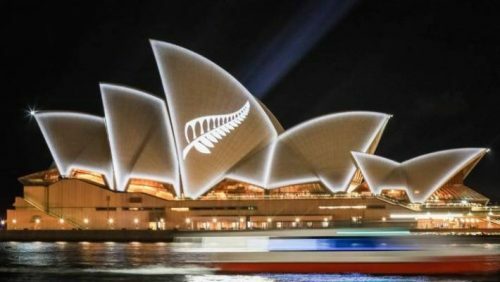 Kiwi’s attitudes towards immigrants and immigration has generally been favorable, at least until recently. They have a better relation with their indigenous people than most colonial Western nations. The reasons that attitudes towards immigrants are souring, however slowly, relates to the same issues we see throughout the West – degradation of services, financial woes, wars causing an influx of immigrants at various times along with other economic factors and so forth. Realities are hitting home, and this comes to the point: What is needed to overcome the causes of the violence we see and of the social ills is a robust, courageous, open debate, outside of echo chambers, between all sectors of society. Saturn/Pluto on the Vertex points to the spiritual reality of this event. It is an opportunity to look past hardened and fanatic attitudes, address the decaying state of our economic order and to take a good look at the old guard political structures that have led to this state of affairs. Shared suffering of the nature we have seen should draw us together as a community, not harden attitudes. If the event does the latter, then we fail as a society. The way forward is seen in the Ascendant – a revolution in dialog (Gemini), that encompasses all members of society (Pisces MC). Then we can proceed to solve matters in a more meaningful manner. All members are needed. If the shooter had one positive message to say from his terribly misguided actions, it would be that we must act, not be complacent, not wait for things to change or for leaders to save us. His soul and karma will seal his fate. May it be swift, for his own soul. It is for us to move beyond the pain he has caused and use it for positive change. May the victims of this tragedy have safe passage in the afterlife, and may the friends, relatives and community heal quickly and make the society the better for it. Blessings to the departed. To those left behind, we stand with you. Please take some time to meditate for healing.